4 How do you properly fold a Graco Jogging Stroller? Graco, being the current world leader in baby products of all kinds, surprises next to no-one by actively marketing a wide range of strollers. What is surprising is just how wide that range really is; dozens of models and variants are there to choose from, and each looks and costs about the same at first glance, not to mention Graco’s competition; even bigger in numbers and even fewer differences between the individual products to be seen. All of this makes something as simple an idea as choosing a high-quality stroller deceivingly difficult. Not to worry, though. That’s exactly why we wrote up this piece right here. Let’s skip the disposables and take a look at the best of the best, so as to not waste any of our precious time, alright? 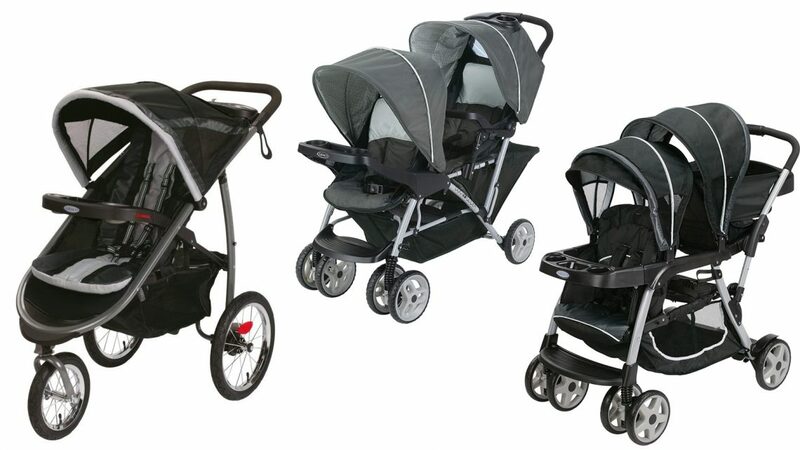 Here are the top Graco strollers for sale right now, handpicked just for you. Here are the 3 best options available on the market. Much like tandem bicycles, two-seat strollers are immensely practical at the cost of often looking absolutely ridiculous. If you can stand the latter, then the former is one good reason already to go for the DuoGlider Click Connect. With its completely separate, weather-proofed seats that remind one more of closed-off cockpits than anything else, the DuoGlider fits its occupants snugly and with as much protection as Graco could shove into the form factor. There is some storage below the two seats, of course, and a footrest in the front, too. Not only do the seats come off so that you can swap them out for any other Graco Click Connect-branded equivalent, but, with the included mounting options, they can serve double duty as car seats, too. Of course, this works vice versa as well; regular car seats can also be installed onto the DuoGlider as a replacement for the default ones. Additionally, the entire DuoGlider folds down far enough for it to be easily stored in the back of your average SUV, station wagon or large sedan. For adjustment, there’s a built-in recline for both seats. Ergonomics are great all around, especially for such a cumbersome tandem model. Not only is the DuoGlider very easy to push around, thanks in part to the design of the handle, but the front and rear wheels provide excellent steering and maneuverability, and they can be locked in place, too. Price-wise, it’s a nice deal as well, coming in at just over $100. However, the DuoGlider isn’t for everyone. First of all, being a tandem stroller, it is anything but compact. True, the folding system is ingenious in the way it can reduce the Graco’s footprint for storage, but it’s still a bulky thing to haul around. If you don’t really have a need for two seats on one stroller, we’d recommend a regular-sized model. Also, some of the materials used, especially on movable parts like the wheel assembly, footrest, handle and others, were not really up to high-end standards. If you really need the tandem design and want nothing but the most dependable and the safest, then go ahead, go get a Graco DuoGlider. While it’s not exactly feature-laden, it’s no barebones product, either. With its exceptional support for Graco’s ClickConnect seats and nearly perfect ergonomics, there’s little, if anything, to complain about. The Fastaction is what’s often marketed as a Crossover stroller; a compact, low-profile single-seater that can be used in a variety of scenarios, from general-purpose to a specialist. In this case, the Fastaction is designed with joggers in mind. Hence, it features spoked, slim rimmed wheels in a tricycle arrangement and a fluid steering system with a hefty suspension setup for both the front and the rear. That, coupled with the form-fitting seat assembly, which includes buckles and straps for added safety, and full weather protection, make the Fastaction not only as quick as its name implies, but very stable, too. However, despite its sporty outlook, the Fastaction doesn’t forget about the everyday convenience features many stroller owners take for granted, such as a swiveling, locking front wheel, front and rear handlebars, ample storage room below the seat, an easy-to-use recline function and a folding action that can be operated with just one hand. It even has twin cupholders! Still, there are some rather questionable design choices to be found. For example, despite being a single-seater, and despite being aimed towards more fitness-conscious buyers, the Fastaction nevertheless comes off as unwieldy, if not outright cumbersome in person. It might not look like it in the pictures, but make no mistake: It’s a very large contraption alright. While good for comfort, it does negatively impact the high-speed performance of the frame. And, given the fact that you only get one seat, the $120 price tag does seem a tad high. At speed, the Fastaction is probably one of the safest ways to transport a toddler or small child, for sure. It also doesn’t compromise much; you still get a fair amount of style, a sturdy build and all the convenience features that one could ask for. Perhaps the value isn’t one of its strong suits, but the Fastaction by Graco remains a top choice for single-seat strollers nonetheless. The Ready2grow is another tandem option, but there’s one feature, or gimmick, depending on how much it appeals to you, that sets it apart from the rest. As the name implies, this model is designed to cover a much broader age range than usual strollers with their default one-size seats. How? By making the front and back asymmetric. Not only that, but the Ready2grow is excessively reconfigurable out of the box to suit a variety of ages without compromise. Without too much effort, one can use the rear area as a standing platform for those on the way to their teens, as a rear-facing seat for young toddlers or as a front-facing seat in numerous, age-appropriate configurations each. There are multiple backrests, weather canopies, lumbar support inserts and more to swap out freely and mix and mingle all around. All in all, that makes for 12 different seating positions, front and back. Despite the size and complexity of the stroller itself, it features the same impressive one-hand, the one-second patented folding mechanism as most other Graco products in this price range. Via ClickConnect, you can also attach Graco-branded car seats to it should you wish. For all that stuff, it’s only natural to expect a noticeably inflated price compared to some more feature-restrained strollers, and the Ready2grow definitely delivers in that regard. With an MSRP of $219 and a common listing price of around $170 to $200, it’s not cheap, but certainly not overpriced, either. There are some limitations, though, most notably to the Ready2grow’s main party trick, its reconfigurability. For example, no matter how you re-arrange things, the rear only holds up to 40 lbs while the front tops out at 50. Why, then, make the rear the larger of the two, enabling it to take larger seats for older occupants? Why not the other way around? Then there’s the fact that only the front portion of the seat has a recline, no matter what you put on there. And then there’s the built-in storage tray, which can get partially blocked by any number of different configurations for the rear. Simply put, your customization options are much more limited than what the PR would have you believe, and it’s all down to less than brilliant design. Though the Graco Ready2grow’s reconfigurability disappoints in some aspects, it manages to pleasantly surprise, if not even amazing in most others. For that, its great build quality, practicality, and value, we see no reason not to recommend it without question. 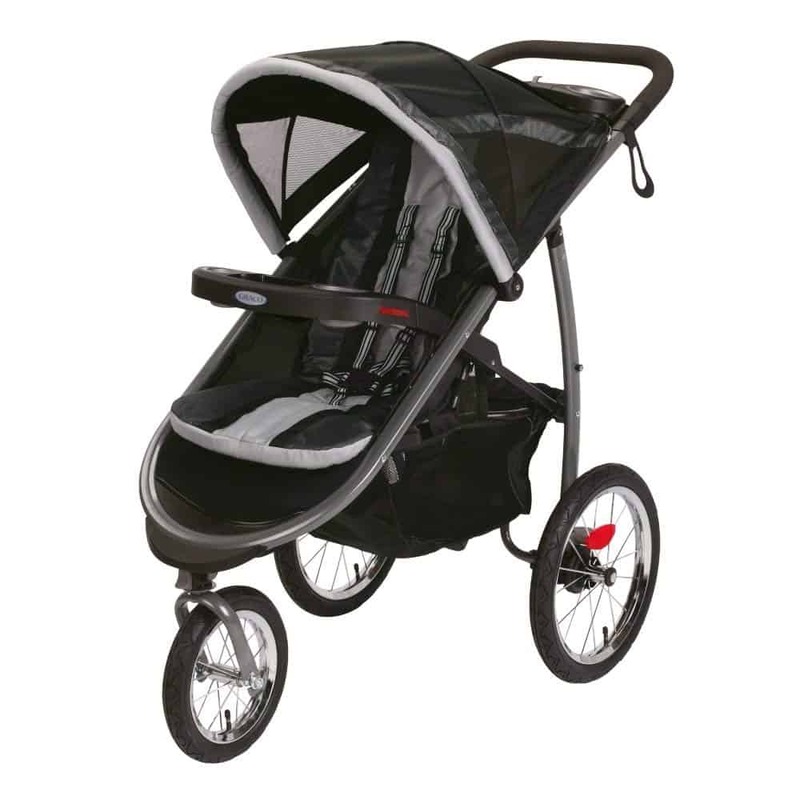 What to look for in a Jogging Stroller. Here are a few points to remember while purchasing a stroller. This is pretty simple in nature but more effective than you might think. With a simple wrist strap tied to the handlebar, you always remain in control of the stroller, even when you take your hands off of it. At high speeds, this is especially useful. Look for air-filled ones with bicycle-like spoked metal rims. These glide over the ground much better than the usual molded plastic ones you’ll find on cheaper strollers. And office chairs. Would you put your child on an office chair and take a jog out in the park with them? No, of course not. What about a bicycle with a baby seat? Much better. You can’t know how often this little gimmick will save you. When jogging, it is imperative that the stroller makes no erratic movements side to side, so a locking feature is the best way to go to ensure safety. When going slower, the added maneuverability of the swivel obviously helps a lot, too. 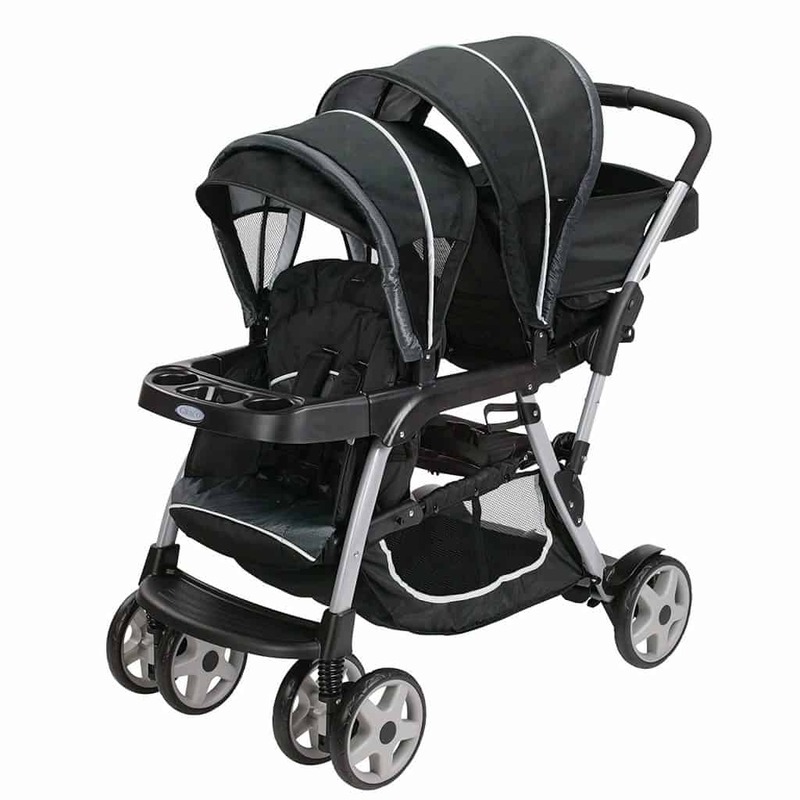 For comfort and safety at top speeds, the seat needs to be positioned deep in the back of the stroller. This not only gives your little one more of a snug fit, but it offers better side protection, too. If your stroller has any kind of weather coverage, it’s easy to transform it into an all-around umbrella on wheels. When going fast, you always want to have the best reach and the best grip possible, as slipping at the wrong moment could very well turn out to be a dangerous mistake. An adjustable handlebar makes it infinitely easier to get into whatever position is most comfortable for you, so it’s a must. 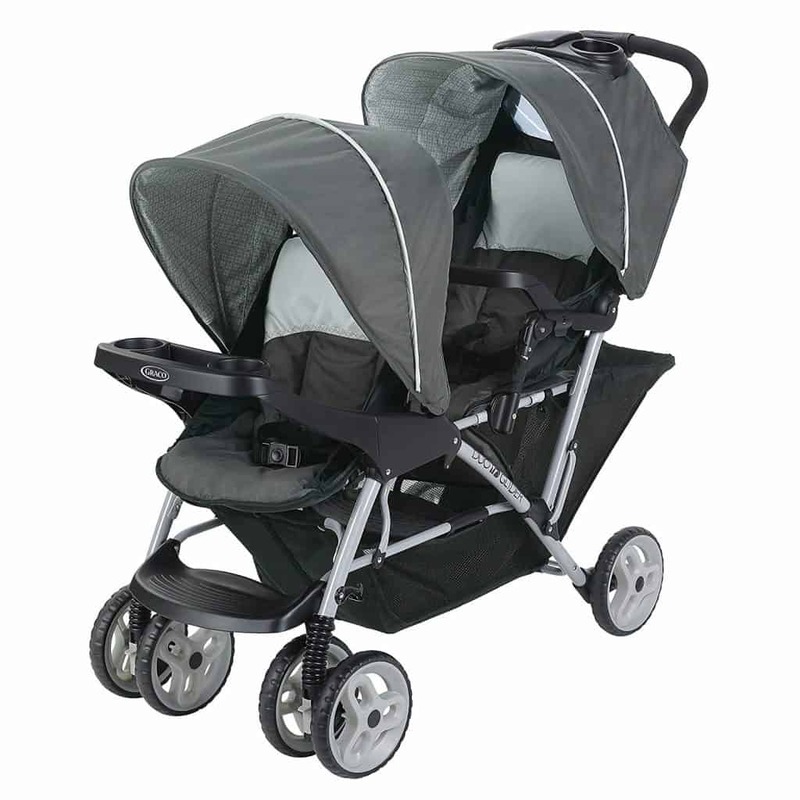 As previously mentioned, the right combo of seating and weather protection can turn a good stroller into a real cockpit for your little one to dwell in, unaffected and unharmed by the outside world. Though most people see them as mere rain blockers, sun canopies actually also do what their name suggests—they prevent your child from catching too much glare, and with it, dangerous UV rays. Especially at this early stage in their lives, this is paramount, so don’t buy a stroller without this accessory. Almost any stroller will have storage below the seat, but how much, you ask? That entirely depends on the make and model. What’s much more important than how much the stroller has is how much you will need, though. Try to think of everything you’ll be taking with you on the average trip out to town, or the average jog in the park. How much space do you need, really? Also consider that many more expensive strollers not only come with a general-purpose storage tray but with specialized holders for phones, purses, drinks or more. As most of us drive almost daily and that is unlikely to ever change in the near future, we must also consider bringing our little ones with us on a different set of wheels every now and then. No matter how safe the dealer told you the car was, a little extra never hurts. That is why it is so convenient if the stroller of your choice can be disassembled and used as a car seat. If you can depend on it in its normal build, then mounting it in the car should only be even better, right? Another, smaller convenience is the ability to mount actual standalone car seats onto the stroller, oftentimes to either expand its capacity or replace the default option once it’s gotten too small. Do look out for that, too—it could save you many headaches. How do you properly fold a Graco Jogging Stroller? Almost all Graco models currently sold feature their unique one-hand, one-second fold system, designed to be as easy as possible. Still, you wouldn’t want to do anything wrong, to accidentally pull the wrong lever and break the thing, would you? Exactly. Let us guide you through the process. First, remove the car seat if you’ve got one installed. Next, collapse the canopy and any other kind of weather protection that may be in position. Finally, find the pull tab on the floor of the seat. Most, if not all modern Gracos have one somewhere, you just need to look for it. When you’ve found it, it’s extremely easy; just take a step back and pull on the whole stroller from the top using the strap. Watch as the entire thing collapses in on itself and folds flat. Done! Some older Gracos, though, don’t have this neat one-hand fold. For those, the procedure is more complicated. The first few steps are the same as above, but you’ll also need to make sure to apply the brakes and lock all wheels. Next, set the recline to its maximum position. The handlebar and back of the seat should both be nearly or fully parallel to the ground. To fold, the same basic motion as on newer models is used, but some older Gracos don’t have the pull handle. In that case, you’ll need to grip the floor or back of the seat with one hand, and the portion of the frame below the seat with the other. Push and pull till you notice the structure collapsing in on itself, and slowly but surely, with both hands, fold it flat all the way. We hope you enjoyed this little cross-examination of Graco and their strollers! Know which one you’ll go with? Remember, safety is paramount, so don’t shy away from buying something that’s a little out of your own comfort zone, whether in price, size, complexity or usability. Your child deserves the effort you’re making, after all!